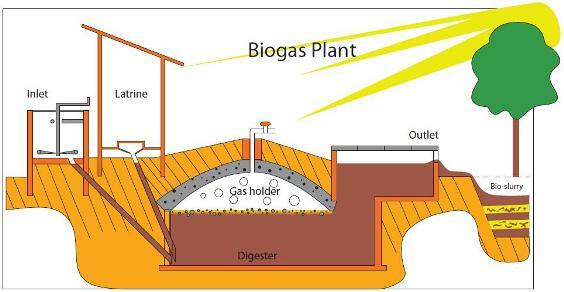 Gobar gas is also known as “Bio gas” or simply “biogas”. Its main component is animal dung (gobar – India) along with some other organic matter like dead remains of plants and animals. It can be used to cooking, electricity generating and heating purposes. It is proving to be a very cost-effective and environment-friendly alternative fuel for rural households. Image by SNV (SNV) [Public domain], via Wikimedia Commons. It is a natural, and sustainable, organic gas manufactured in huge closed containers. And, in the light of the growing energy shortage that India faces, gobar gas is being cited as having great potential. It is also another eco-friendly energy source alongside wind energy and solar, but many people don’t know about it. 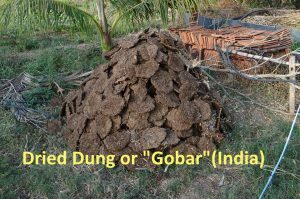 The “cow dung” (also buffalo dung etc) or “gobar” gas has a lot of energy within it, which can be stored for a biogas plant by the process of fermentation. 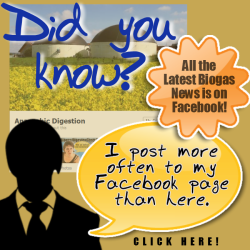 Despite the lack of public awareness of biogas in general, it can at least go part-way to provide the answer to the energy needs of rural areas. Furthermore, this gas can be produced from regionally available raw materials and recycled waste and is environmentally friendly and pretty much CO2 neutral. 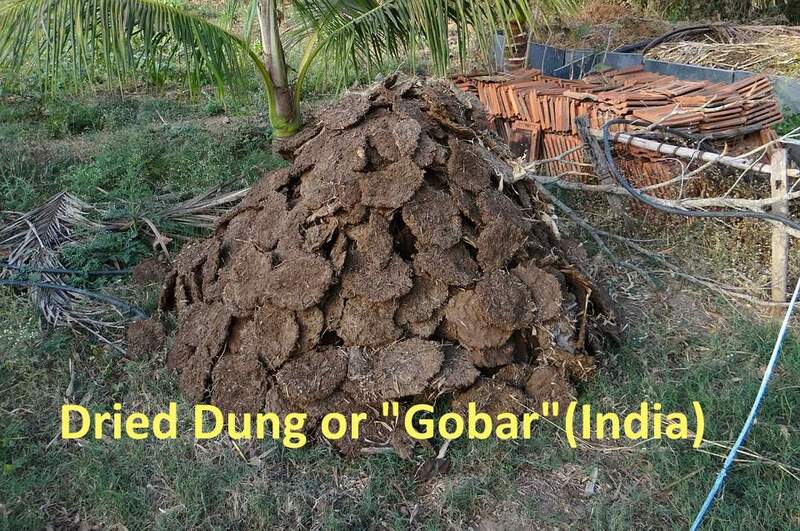 A pile of “gobar” – dried dung, suitable for Anaerobic Digestion. 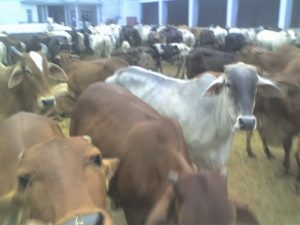 In a gobar gas plant, “gobar gas” is obtained by bacterial fermentation of animal refuse. To be a little more specific about the process which makes it. It is produced by the anaerobic digestion or fermentation of biodegradable materials such as manure, sewage, municipal waste, green waste, plant material, and crops. Gobar Gas is a renewable fuel (methane) so it qualifies for renewable energy subsidies in some parts of the world. When gobar gas is cleaned up by a process called biogas upgrading. After upgrading, the purified biogas is ready to be used as fuel in a massive number of applications for motor car fuel, to running massive gas turbines. Any CNG converted internal combustion engine can be connected to an alternator to produce electricity. Hence, an easy off-grid electrical power supply which doesn’t hasten climate change, becomes available to all nations rich and poor. The heat generated during the combustion of bio gas, or “gobar gas” can be used for use in other processes that require significant heat. Electricity generated by fuel cells using gobar gas can serve at night. This point about gobar gas can be again used in the discussion about replacement of other sources of electricity like hydro power, thermal power, and nuclear power with biogas energy plants. This gas supply source can equally be applied to counter-insurgency and stabilization programs with Afghanistan as an example. With the continuing development of science and technology it is considered that gobar gas will be one of the biggest fuel-providing resource, in the future. Indeed, introducing a community to a safer, greener, more eco-friendly energy option will make their lives happier, plus much more sustainable in the long run and protect the forests. This “dung gas” is going through a revolution. It has already, for example, been a quiet engine of ground-level economic transformation in Nepal and numerous other poor Asian and African nations. There are millions of these plants in homes and communities in China as well. Of course gobar gas has undoubtedly now already, come to stay. Are you making the best use of it in your farm or rural community?